In 1961, reacting to U.S. government plans to survey, design, and build fallout shelters, the president of the American Institute of Architects told the organization that “all practicing architects should prepare themselves to render this vital service to the nation and to their clients.” Here, David Monteyne, author of Fallout Shelter: Designing for Civil Defense in the Cold War, shines a historical light on the doomsday bunker's recent surge in popularity—and how they were originally built to protect government officials. 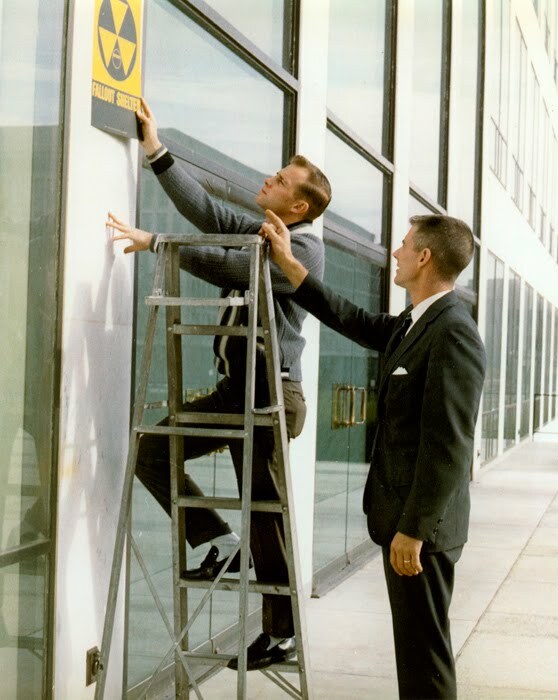 A fallout shelter sign gets posted on an apartment building in the early 1960s in Falls Church, Virginia. Photo no. 29-S-106; RG 397-MA; National Archives, College Park, Maryland. Recent articles on CNN and MSN.com suggest that Americans suddenly are commissioning and building backyard and underground bunkers to protect themselves from the end of the world. Portents of apocalypse these days include the Japanese earthquake and tsunami as well as 2012 predictions of the Mayan calendar. Only a few years ago it was Hurricane Katrina, and before that al-Qaeda, and Y2K, and so on and so forth. In fact, these spikes of interest in personal protective construction can be traced steadily back to 1945, at least, when the bombings of Hiroshima and Nagasaki led immediately to fears of an atomic Pearl Harbor. However, even at the peaks of Cold War nuclear fear in the early 1950s, early 1960s, and early 1980s, few people in the United States actually built or bought bomb, fallout, or other types of shelters. While this spring’s reports claim that “inquiries” and sales of personal bunkers “have gone through the roof,” citing massive percentage increases, we ought to note that the real numbers tell the usual story. Quadrupling sales, when typical sales are one per month, still doesn’t add up to much other than hype. As a number of Cold War historians have shown, things were little different during the McCarthy, Kennedy, or Reagan eras. Much more interesting than what a few well-prepared, or paranoid, citizens have done is what the federal government—and the experts and professionals mobilized by it—have done to prepare for apocalyptic wars and other non-routine events. As I argue in Fallout Shelter, government programs of the 1950-60s proposed and produced massive interventions, research projects, and propaganda campaigns to demonstrate a national capability for protecting every U.S. citizen. In particular, the book explores how architects (and to some extent, engineers and urban planners) were mobilized by the state to imagine, project, and occasionally build, spaces safe from the Cold War threat of nuclear war. Bunkers certainly played a role, but most of the ones actually built to resist nuclear blasts and firestorms and initial radiation pulses were for the protection of government officials. Meanwhile, the government proposed that civilians only needed protection from a singular threat: fallout. Those other aforementioned effects were written off along with their victims (according to the Department of Defense at the time, 100 million or so dead Americans in a full-scale nuclear exchange). Fallout shelters just needed to block residual radiation over the days and weeks following a nuclear war. Accordingly, civil defense experts took an optimistic tone. As Architectural Record noted in 1962, “the building you are in right now is a fallout shelter,” because all buildings blocked some radiation. It was up to professional architects to determine which buildings provided better protection than others. The National Fallout Shelter Program, which was instituted by JFK in 1961 and remained active for the next decade or so, represents the United States’ most sustained and extensive development of civil defense—at least prior to the Department of Homeland Security. Architects were key players in the Program. First, they were sent out to survey every structure in the United States for its fallout shelter potential, a gargantuan and unprecedented task. Then, the American Institute of Architects teamed up with the federal civil defense agency to educate professional designers about fallout shelter design and to encourage them to deploy its methods in every new project. The evidence of the National Fallout Shelter Program still marks buildings today: its trademark shelter signage in black and yellow hangs by entrances and basement stairwells; and often, piles of rancid crackers in moldering cardboard boxes, heavy barrels of water, and partially pilfered first aid kits are tucked away in some forgotten corner. Many of the early continuity of government bunkers have suffered the same fate, though a couple of them have become tourist attractions. However, the U.S. government continues to maintain others and to build new ones. Certainly, the activities and the legacies of the National Fallout Shelter Program—not to mention the government’s Cold War civil defense in general—reached far further than a scattering of backyard and basement shelters. Read more in Fallout Shelter: Designing for Civil Defense in the Cold War, which details activities from the training of architects as shelter analysts to the design competitions, charrettes, and awards for buildings with fallout shelter. When Species Meet: "The dog ate it."